IGetMusic ($40; ten-day free, feature-limited trial) is an interesting app that listens to Internet radio stations for you and turns their streaming music into numerous portable M4A files, which can be played on most MP3 players. iTunes or other music apps can convert these into MP3 files, if you wish, for total portability. Unfortunately, this isn't one of those easy-to-use, launch-and-go apps. Five songs are recorded at a time from AOL’s Internet radio station in the iGetMusic trial version. Configuring iGetMusic is a massive pain. First, you have to modify the Internet settings of your browser and add a proxy, which allows the app to capture the specific Internet music Web sites that iGetMusic supports. Then, you have to restart your browser with the new settings. Then, start the iGetMusic app and choose a folder--but folders like "iTunes Music" will trip up the app as it can't handle spaces in folder names. (If you try, it'll instead create a new folder and truncate the rest--in this case, a folder named iTunes.) Also, you have to type in a genre of music that matches the station to which you'll be navigating, then click Start Server. There's no list of genres within the app (though such a list would be helpful), so you might want to check on your preferred Internet radio station and see which ones they include. Then, you have to navigate to the music radio site in your web browser and pick the matching station. (The app supports three sites: AOL Radio, Yahoo Launchcast, and Play.it.) Though iGetMusic displays a few lines of notification when the server is started, there's no indication that this whole process works until three minutes into the first song, at which point song titles start appearing and M4aAfiles begin to be created. As you can imagine, this took a lot of trial and error before it finally worked. Also, saved M4A files are only of middling audio quality due to the nature of Internet radio: 64 kbps bit rate, which will sound pretty terrible on decent audio equipment. As a point of comparison, iTunes' "Higher Quality" setting is 196 kbps. Asking your users to modify the security settings of your browser to get your app to work right is a tall order, and it's a step many casual users will be unable or unwilling to take. Also, due the nature of the proxy server, when the five-song limit of iGetMusic's trial version is reached, the Internet radio station will quit playing music as well, until you either restore your Internet settings or buy the full version. 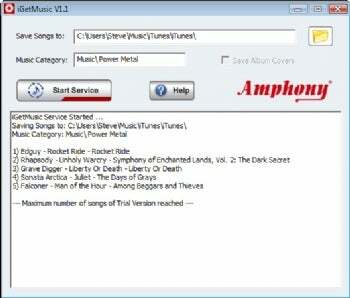 Hopefully, Amphony will release a version of iGetMusic at some point that works independently of browser settings. The full version of iGetMusic can record multiple audio streams simultaneously, even when those extra streams are muted, so it's a way to amass a huge audio collection overnight or while you're doing other things. Amphony claims their service is completely legal, as it's simply capturing DRM-free radio streams, similar to tape-recording your favorite radio station. It admonishes users not to share the resulting music files. If your goal is to capture a ton of audio files quickly and inexpensively, and you're not concerned about modifying your browser's settings or the quality of the files themselves, give iGetMusic a spin. The rest of us will avoid the massive hassle and just buy dollar tracks on iTunes or Amazon MP3. Note: This trial/demo version can only record five songs at a time. Album covers cannot be saved, and the app expires in ten days. The full version costs $40 for a single-PC license.